When you read the word baby in the title of a piece of hardware, do not think anything of it. It is just a piece of hardware letting you know that it is going to be compact. Speaking of hardware, Sigelei is a pro when it comes to creating some of the best. Even when you think there is nothing else they can do, they surprise us with something else. The Chronus 80W Baby Kit is the name of kit that is going to leave you wondering where has this piece been all your life. 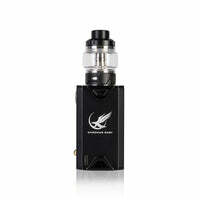 The box mod and the sub-ohm tank that come in the packaging will have a pretty small stature when they are connected. The integrated rechargeable battery will have a capacity of 2000mAh, which is a lot compared to the other kits in the vaping market. As we said, there is nothing baby about this bad boy. The wattage output will range from 10W to 80W, the voltage output range is 3.2V to 4.2V, and the resistance range will be from 0.05ohm to 3.0ohm. There will also be a temperature control range of 212˚F to 572˚F. This kit is definitely going to have it all! The tank will have a stainless steel construction and a capacity of 5.5ml. Do not waste your time with other mediocre products, and just get your hands on this kit that comes from a reliable brand.